As was stated in our YE 2016 report, the Tucson MSA multifamily market, after years of general stagnancy following the Great Recession, saw renewed investor interest starting in 2016. According to Elliott D. Pollack & Company, Tucson MSA's jobs were up 0.6% y-o-y and are up 0.5% year-to-date. Additionally, the type of new jobs being created/announced in the Tucson MSA has continued to evolve. In fact, Tucson recently made it onto WalletHub's 2017 Best Places to Find a Job (https://wallethub.com/edu/best-cities-for-jobs/2173/) at #102 (of 150). Notwithstanding Tucson's sizeable 2,000+ call center job announcements from 2016 through YTD; in 1Q 2017, international mining tech firm, Hexagon, announced its plans to expand and relocate its headquarters to Downtown Tucson joining Caterpillar who announced plans to move there in 2016. Other major job/economic announcements, and referenced on the map on Page 5 of this report, include: ADP's plans to add 250 jobs to the area, Ernst & Young will be hiring 125 as it opens a new support center in Downtown Tucson and Tucson-based Vector Space Systems broke ground on a new facility in the Pima County Aerospace Park and debuted ‘the world's smallest satellite launcher rocket,' after raising $5M in funding. The MSA's total sales volume (10+ unit properties) decreased (11%), year-over-year, to $155M. Although total sales volume decreased, the total number of transactions and units purchased increased, 20% and 33% respectively, to 32 total transactions representing 3,646 units. Additionally, average year built for all projects purchased witnessed a steep decline of 9 years to 1968. Considering that both 10 to 99 and 100+ unit properties saw large average year built contractions with steep rises in amount of units purchased would suggest investors are switching to more value add, i.e. renovation, strategies to increase overall project value. Nearly 32% of all units sold during 1Q were purchased by New York-based Dasmen Residential who acquired Omninet Capital's 1,166 unit, 4-property portfolio. California-based investors were #2 with 986 total units purchased, Arizona investors were #3 with 627 units followed by Washington DC and Illinois-based investors with 318 and 199 units purchased respectively. The 10 to 99 unit properties witnessed the most dramatic percentage increase in sales volume, as well as units transacted, rising 89% y-o-y to $28.7M and 94% to 803 units transacted. Conversely, 10 to 99 unit properties saw y-o-y sales price per unit amounts contract a nominal (3%) to $35,703 with average age of the property dropping 5 years to 1963. Although 100+ unit properties saw a significant decrease in total sales volume down (21%) y-o-y to $126.7M, the 100+ unit properties witnessed a 22% increase in total units transacted to 2,843 units with a steep, 16 year, drop in average year built to 1977. In regards to new construction, Tucson MSA had 318 new units delivered by the end of the 1Q, 90% y-o-y increase. Despite near term elevated construction delivery schedules, average rent for the MSA increased 5.4% to $796 while experiencing a mild occupancy rate contraction of (0.2%) to 94.1%. 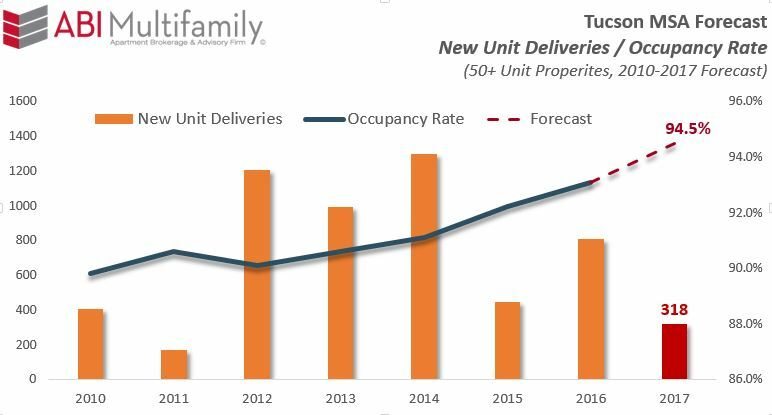 It should be noted that Tucson has a very limited supply of new multifamily projects under construction; Tucson, looking forward, is now at a 5-year low for new units coming online. In fact, our projections show no new ‘market rate' units will be delivered (50+ unit properties in size) to the market until the end of 2018. As such, we're anticipating both Rent and Occupancy Rates to hit market highs of $806 and 94.5% respectively by the end of the year. With many of the larger western MSA's reaching, and exceeding, previous peak price per unit amounts has caused investors, on the hunt for higher yield/CAP rates, to look to qualified secondary and tertiary markets. Tucson which saw tremendous economic and job announcement activity through 1Q 2017, and with little in the development pipeline, is fast becoming the ‘go-to' secondary market for multifamily investors. Given Tucson's now 5-year low for projected new unit deliveries and with economic and job prospects at, or nearing, 7 year highs lays the foundation for a market not witnessed by Tucson investors in at least a generation, if ever. The confluence of these two conditions will continue to shape the Tucson multifamily market well into the latter half of 2018 as new units will be brought online. Until that time both, and barring any Black Swan events, Occupancy Rates and Rents should continue to reach all-time highs and make Tucson one of the more active secondary markets in the county.